Whether you are a high or low maintenance woman when it comes to your beauty regime, introducing a weekly mask into your evening ritual will bring benefit to your complexion and create a wonderful habit of pampering yourself in the privacy of your own home. Caudalie, a French brand based in the heart of Bordeaux, has a wonderful outpost in the heart of Covent Garden, where you can come in for a relaxing facial or just pop in to speak to one of the shop assistants who will, without pressuring you to buy, guide you, depending on your skin types, seasonal or specific skin needs. Just in time for spring and the rejuvenation it brings with it, Caudalie re-launched some of its best-selling masks, as well as added a new one, in the new packaging and with a better price point for the customer as well ( you paid £19 for the 50mls mask previously, now each costs £22 for 75mls). I will start with Caudalie Moisturizing Cream-Mask which was originally developed to hydrate and sooth all skin types. The formula hasn’t been changed ( and thank god for that as many beauty brands tend to re-formulate customer favourites, leading to customer frustration & confusion ) and it still gives the skin a cocooning feel, even if you have oily skin. This mask can be used twice a week and can be applied around the eye area as well. I have also been known to massage it in at night-time and sleep with it on my skin, instead of the night moisturiser, but do see if that tip works for your skin type. The mask contains Grape Seed Oil & patented Vinolevure and has a soothing, calming smell that somehow makes you feel cocooned & protected. Caudalie Glycolic Peel ( before it was an Enzymatic Peel Mask ): this non-irritating exfoliant was created to help activate the process of cellular renewal and make your skin fresh, bright and improve your skin tone, making it more even. The mask contains Glycolic Acid, Grapevine shoot extract and Papaya Enzyme and the clinical trial based on 23 volunteers noted a 100% satisfaction in terms of the renewed skin effect. Apply the mask to your clean face and keep it on for 10-15 minutes. I was told that this mask is safe to use on sensitive skin and can be applied to old scars. However, as with any new skincare product for you, do a test patch first to see if it suits your skin type. This mask can also be used as a pre-party ‘pick me up’, as it makes the skin look more radiant. It has a rich, creamy texture and a very pleasant, uplifting smell that is indulgent for the senses. After ten minutes the creaminess disappears into your skin and all you need to do is wash it off ( the mask turns into a milky consistency and when you pat your face dry your skin will feel soft, hydrated, smoother & radiant – that is my own experience with the mask ). It can be tempting to use it often when you see such a lovely effect but even though the mask itself is gentle enough, it does contain a glycol acid so don’t ‘overindulge’ or your skin can rebel. Caudalie Purifying Mask ( clarifies, purifies, anti-blemish ): this mask is suitable for combination and spotty skin, as it helps to clarify it. It is also a lovely mask to use after travel journeys as it contains zinc ( helps to heal spots ), sage ( anti-bacterial ) and white clay that doesn’t tighten your skin to the point of discomfort – it is one of the most versatile clays and widely used in skincare. Apply this mask to your clean but wet face, leave it on for ten minutes and then wash off with a muslin cloth or just with warm water. You can use it once or twice a week, depending on your skin’s needs and that should be your guide when you decided what mask to use – do get to know your skin, it will help you look younger and fresher whatever your age. The mask has a fluffy clay like texture with a slightly medicinal, but lovely smell. new Caudalie Instant Detox Mask ( deep cleanse, pore minimising ): this is Caudalie’s latest launch and considering the fact that they don’t follow trends but launch the products only when they are perfectly happy that it will fit within the existing products, I was quite curious to see what it does. The clue, of course, is in the name! The mask contains coffee, grape marque and pink clay all of which will help to rejuvenate your skin, tighten pores and detoxify the skin on its surface. This is a mask the effect of which might be called ‘oh la la’! Apply the mask to clean, dry skin and let it dry for 5-10 minutes. The consistency of the mask (creamy, bright pink) becomes dry, as if you have put your face in the healing mud on a sea shore and it has dried up in the sun ( the consistency changes from ‘wet’ to ‘dry’ fairly quickly, so don’t keep it on for too long !). Before removing the mask, spray your face with Caudalie Grape Water and then wash the mask off with a clean muslin cloth and warm water to reveal a rejuvenated complexion that will hopefully draw a smile when you look at your reflection in the mirror. I tend to spray my face with Grape water again, let it dry and then apply my usual evening serum, moisturiser or face oil, completing my evening skincare routine. 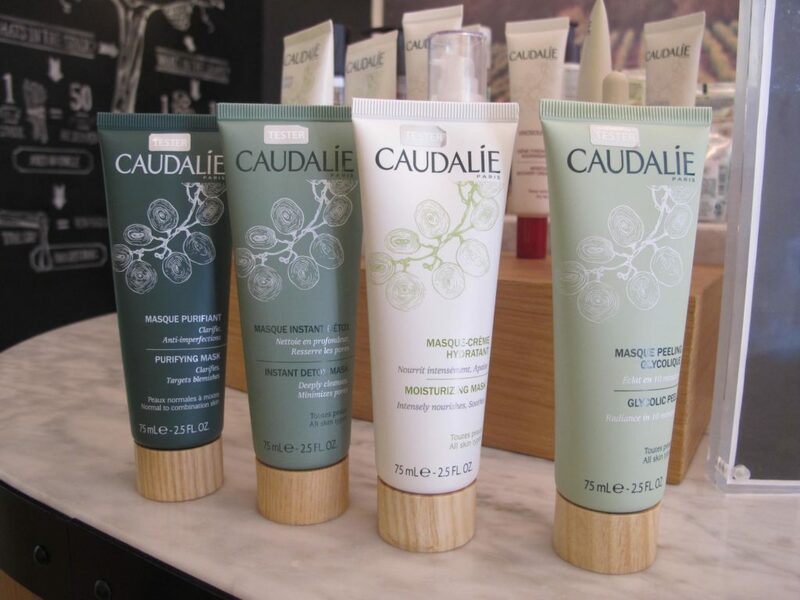 I had an initial trial of the newly re-packaged, plus one new mask, at the Caudalie shop and Spa in Covent Garden, guided by its wonderfully knowledgeable Spa Manager (merci mil fois mon cher Axel !) and since then have been indulging my skin at home. I hope this mask review will encourage you to start using masks regularly, in the privacy of your own bathroom or when there is no-one to critically examine your face or smirk at you with the mask on – I, for one, am old-fashioned and don’t believe in applying a mask and posting a photo online or prouncing around my other half while I beautify myself. Looking after one’s skin is a pleasure and a greatly effective age-proofing strategy that allows you to experiment with textures, brands and results and find the ones that work best for you, enhancing your existing skincare routine. Regular exfoliation and use of masks is definitely my beauty secret that I am happy to share with you. I am always happy to hear about your favourite masks or tricks that you use as part of your skincare routine. And if you already use Caudalie products or plan to, let me know your thoughts and experiences as well.